The War on Drugs is a vast, complex phenomenon, spanning from its origins in Nixon’s presidency to the push for legalized marijuana and more lenient sentencing laws. Most people have a lukewarm understanding of how the War on Drugs has impacted society- huge expenditures of taxpayer money going to fund state/private prisons, millions of Americans in jail (of which, a disproportionate amount are those of color), bloodbath in Latin America and derision in Washington, D.C. But few people, besides those afflicted, can speak to how the War on Drugs has unfairly impacted those struggling with substance abuse. In order to understand the impacts of this policy, one must first understand the history of the War on Drugs. President Nixon was the first person to coin the term “War on Drugs,” in 1971, in response to the proliferation of drug culture in the 1960’s. During this time, Nixon temporarily placed marijuana in Schedule One, the most serious category of drugs. Though the level has since changed, the stigma has stuck. The 1970’s witnessed more permissive drug laws, it was with Ronald Reagan’s presidency in the 1980’s that mass incarceration and drug abuse really took off. Reagan incited a period that witnessed the number of people imprisoned for drug crimes growing from 50,000 in 1980 to over 400,000 by 1997. Additionally, his wife, Nancy Reagan, coined one of the most popular anti-drug catchphrases (“Just Say No”) as a response to rampant drug use, especially use of newly-created crack cocaine. The hysteria witnessed by the public during this time allowed a myriad of drug policies that spurred incarceration to be passed. This stigmatized view of drug use continued until the mid-2000’s. 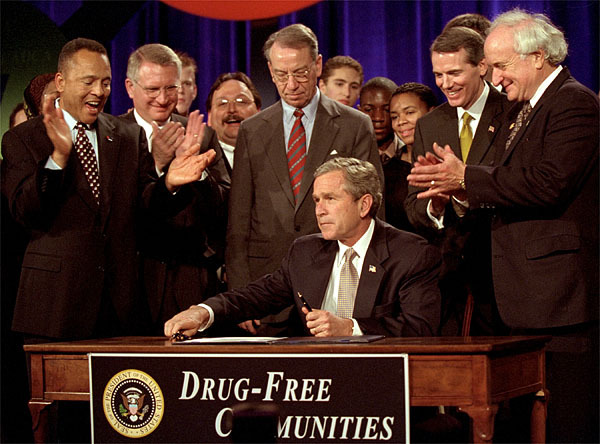 During this time, drug use admissions from political figures helped America begin to adopt more sensible drug policy. This includes health-based initiatives and a shift towards decriminalization, especially in regards to marijuana. However, there’s still a long way to go with half a million people still behind bars for nothing more than a drug law offense. Additionally, little is being done to combat the opiate crisis. President Trump recently selected Kellyanne Conway to be the “czar” in the fight against opioids, but almost no money has been appropriated to really combat the issue. This brings us to the struggle of addicts, helpless against the whims of American politics and in desperate need of treatment and services. Current drug policy not only is ineffective in helping addicts, it also deeply hurts them. As anyone who has experience with an addict knows, an addict will go to any lengths to get their drug of choice. Because the War on Drugs has driven drugs so far underground, addicts put themselves in extremely dangerous, precarious situations to obtain their fix. Another way in which the War on Drugs severely impacts addicts is that the majority of drug-related funding goes to the incarceration of drug-related offenders. Addicts end up in jail, rather than a treatment center. Over 50 percent of federal inmates are in prison for drug-related crimes and the solution that’s supposed to “set them straight” usually just leads them to relapse and do the same things that got them into jail (shockingly, current American recidivism rates are at 68 percent within just three years of release). Surely, there’s no easy fix to the behemoth national drug problem, but policies that act to rehabilitate and help drug addicts rather than place them in situations that only serve to be triggering, are a good place to start. If you have a personal experience with an addict and don’t know where to begin, contact the empathetic, supportive professionals at Recovery Care Partner.